The Czech Republic will be holding an early general election later this year - nearly a year ahead of schedule - after the center-right coalition government of Prime Minister Mirek Topolánek was brought down last week in a parliamentary no-confidence vote. Topolánek, who submitted his resignation last Thursday but remains as caretaker head of government and leader of the Civic Democratic Party (ODS) - the largest party in the Central European country's bicameral legislature - subsequently reached an agreement with former Prime Minister Jiří Paroubek, the leader of the Czech Social Democratic Party (ČSSD) - the main opposition force - to hold an early poll next October; a specific date remains to be determined. Prime Minister Topolánek came to office following a closely fought general election in June 2006, which left the Chamber of Deputies - the lower house of the Czech Parliament - evenly split between left- and right-wing parties. However, in early 2007 Topolánek was able to secure a parliamentary majority with the help of two rebel ČSSD deputies, and he went on to survive four no-confidence motions during the course of 2007 and 2008. Nonetheless, his government depended upon a fragile majority, which was finally shattered when four dissident deputies - two from ODS, plus two recently expelled from the Green Party (SZ) - sided with ČSSD and the Communist Party of Bohemia and Moravia (KSČM) to pass by 101-96 a vote of no-confidence. Coincidentally, the fall of the Czech government came on the same day that Topolánek - who currently holds the European Union's rotating presidency - made headlines around the world when he criticized the economic stimulus program of U.S. President Barack Obama as "the road to hell." While the vote of confidence was triggered by allegations of abuse of state subsidies by a deputy who left ČSSD to support ODS, some opposition deputies voted to bring down Topolánek as a protest against his government's economic policies, which according to them failed to deal effectively with the global financial crisis; although the Czech economy is not in as dire straits as those of other nearby countries (such as Hungary), the Czech Republic is nonetheless forecast to suffer a recession this year. Opinion polls have ČSSD ahead of ODS; that said, the gap between the two parties appears to be narrowing down. Nonetheless, the Social Democrats are hoping for a repeat of their performance in last October's regional and Senate elections, in which ČSSD captured 23 of 27 Senate mandates up for renewal, depriving ODS of its absolute majority in the upper house of Parliament. Although it has some ex-Communist members, ČSSD is not a post-Communist party; unlike major left-of-center parties in other Eastern European countries, it traces its roots to the Social Democratic Party that was forcibly merged with the Communists in 1948. However, the Czech Social Democrats have to compete on the left with the Communists, who still command a significant following. The Czech Chamber of Deputies is elected by party-list proportional representation in regional constituencies - Parliamentary Elections in the Czech Republic has a review of the Czech electoral system - and no single party has ever commanded an absolute lower house majority. Moreover, the ongoing presence of a sizable, unreformed Communist Party has greatly complicated the task of forming stable governments in the Czech Republic. While the Social Democrats have called upon Communist support from time to time (as they did for last week's no-confidence vote), neither them nor the parties to their right regard the Communists as suitable coalition partners, largely for historical reasons: save for the short-lived "Prague Spring" of 1968, the Communist Party governed Czechoslovakia - the now-defunct federation of the Czech Republic and Slovakia - in a totalitarian fashion from 1948 to 1989, when the Velvet Revolution put an end to the Communist regime. As a result, since 1996 the Czech Republic has been ruled either by shaky coalition cabinets, such as those formed from 2002 to 2006 by ČSSD and the four party coalition headed by the Christian and Democratic Union-Czechoslovak People's Party (KDU-ČSL), and from 2007 to the present by ODS, KDU-ČSL and SZ; or by minority governments dependent upon the good will of the opposition, as was the case from 1998 to 2002, when ODS reached an "opposition agreement" with ČSSD under which the Civic Democrats tolerated Milos Zeman's minority Social Democratic government without supporting it. In fact, Topolánek may have to reach out to the Social Democrats in order to secure Senate passage of the Lisbon Treaty, which would streamline the functioning of the European Union. While Topolánek is in favor of the treaty, many Euroskeptics in ODS remain opposed to it, as is President Vaclav Klaus, the former leader of the Civic Democrats. At this juncture, it remains unclear what will happen to Prime Minister Topolánek's outgoing government until the election is held. ČSSD leader Paroubek declared that he is willing to tolerate the government until the end of June (when Sweden takes over the EU presidency) if certain conditions are met, but favors the appointment of an interim government of non-party experts after that date. Meanwhile, Topolánek insists on remaining in office, but he and President Klaus - who has the right to appoint the next government - are political enemies, and not surprisingly Klaus is proposing the formation of a new cabinet without further delay. However, Czech governments require majority support in the Chamber of Deputies in order to remain in office, and in light of last week's events it appears rather unlikely that such support would be forthcoming. 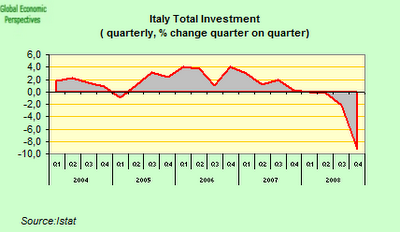 There is no doubt about it: Italy's economic situation has worsened considerably during the current quarter. 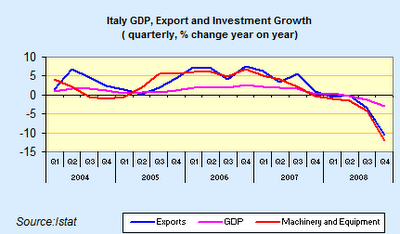 Only last week the OECD forecast that Italy's gross domestic product is likely to fall by 4.2 percent in 2009. 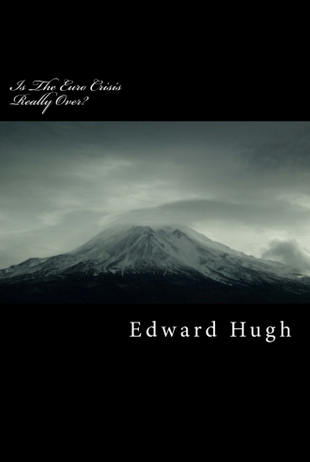 This follows hot on the heals of an earlier statement where the OECD said the situation in Italy this year and next was "much worse" than it had previously thought, and that Italy would not come out of its recession until "sometime" in 2010 at the earliest. According to the earlier forecast the OECD expected GDP to fall this year by one percent and then by a further 0.8 percent in 2010. 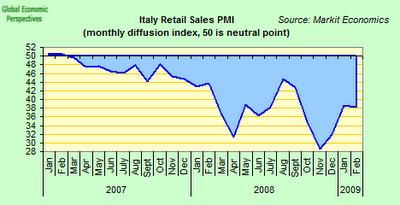 The Bank of Italy has also changed its forecast, and now suggest that GDP this year will fall by 2.6 percent. 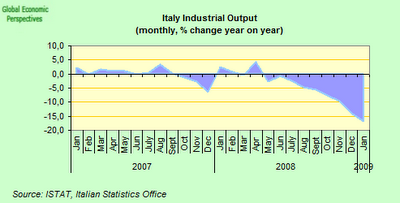 In January (the last time they revised their Italy forecast), the IMF forecast a fall of 2.1 percent. This is almost certain to be revised downwards in the April World Economic Outlook forecast review. Only today the Italian employers’ lobby Confindustria cut its forecast for 2009 GDP , saying the economy will contract by 3.5 percent while public debt will climb to 112.5 percent of GDP. And these forecasts are not drawn like rabbits out of a hat, since evidence of the deterioration in Italy's economic performance is now to be found everywhere, but perhaps nowhere is it clearer than in the most recent exports and industrial output numbers. 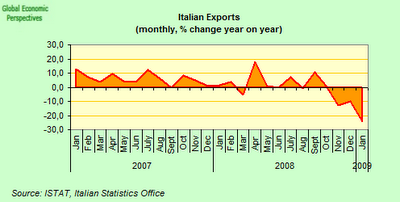 Italian exports plummeted 26 percent in January from a year ago, the biggest drop since records began in 1991. With the drop in exports leaving the country with a trade deficit of 3.6 billion euros. Meanwhile Italian industrial output fell for a fifth month as what is now the country's worst recession in more than 30 years forced companies to keep cutting output and jobs. 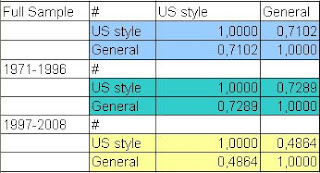 Production dropped a seasonally adjusted 0.2 percent from December, when it fell a revised 3.9 percent. 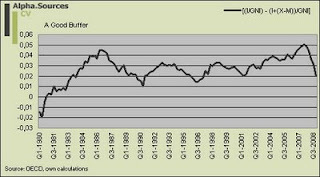 From a year earlier, adjusted production fell 16.7 percent, the biggest decline since records began in January 1991. 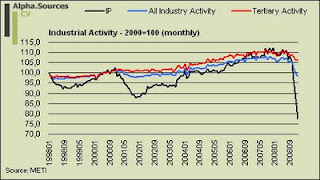 As we can see from the revised output index, after remaining pretty much stationary from early 2007, production really started to slump in May 2008, and hasn't looked back since. Italy's manufacturing PMI fell again in February to 35.0 from January's 36.1, and was only marginally above November's series record low of 34.9. Italian business confidence fell to a record low in March as concern that the fourth recession in seven years will damp orders more than offset lower oil prices and borrowing costs. The Isae Institute’s business confidence index dropped to 59.8, the lowest since the index was created in 1986, from a revised 63.2 in February. Italian executives also reported having more problems getting credit in February, when the report showed that 40.2 percent of those surveyed said the credit situation worsened, up from 33.5 percent in January. The new orders sub component also fell, to minus 65 from minus 58 in January, the lowest since 1991. 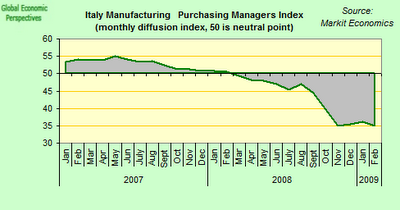 And manufacturers’ expectations for production over the next three months fell to minus 24 from minus 20. Italian retail sales contracted for the 24th consecutive month in February as the credit crunch tightened its grip on spending, and consumers put off purchases of cars and home appliances. Italian service sector activity sank in February to its weakest level on record, the latest sign of a deepening recession in the euro zone's third largest economy, the latest Markit/ADACI PMI survey and the Index, spanning companies from hotels to insurance brokers, fell to 37.9 from 41.1 in January to hit the lowest level since the survey began in January 1998. Italian fourth quarter GDP fell a downwardly revised 1.9% from the previous quarter, the largest drop since 1980, compared with a downwardly revised 0.7% contraction in the third quarter of 2008 according to data published by the Italian statistics office Istat last week. 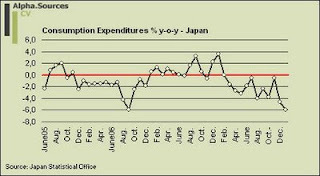 On a year on year basis GDP fell a downwardly revised 2.9%, also the sharpest drop since 1980.
Business investments fell by 6.9% during the quarter, consumer spending fell 0.6%, while exports plummeted 7.4%. 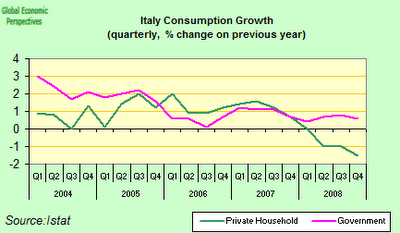 As can be seen from the chart below, given the endemic weak state of Italian household consumption, GDP growth tends to follow export growth. 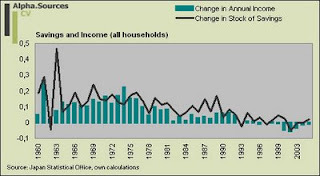 Although, of course, household consumption has now been falling back sharply since early 2007. 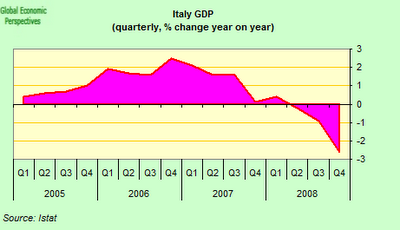 2008 data for Italian GDP has now also been published, and again the drop of 1,0% has not been seen since 1975. Italy's economy will shrink by around 2.6 percent this year, a member of the Bank of Italy's executive board said on Wednesday, cutting the central bank's previous forecast of a 2.0 percent contraction made in January. 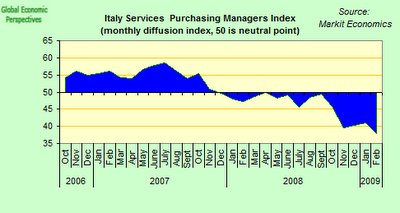 Since January, Italian economic data has been consistently bad, with business confidence and purchasing managers' indexes plumbing new record lows. The government pencilled in a forecast of -2.0 percent in its Stability Programme issued in February, but many analysts have cut their forecasts even lower than the BOI. Intesa San Paolo, Italy's largest bank, has a forecast of -2.9 percent. While Italy’s unemployment rate rose in the fourth quarter to the highest in more than two years as the recession deepened, prompting companies to reduce production and jobs. Joblessness increased to a seasonally adjusted 6.9 percent from 6.7 in the previous quarter, the Rome-based national statistics office said today. The number of unemployed rose to 1.73 million in the third quarter, when 1.69 million people were out of work. For some time now Italy’s government has been abandoning its optimistic rhetoric and adoptinmg a more sombre assessment of the economy. Giulio Tremonti, the finance minister, recently told a conference that 2009 would be “even more difficult” than last year, with two leading newspapers quoting him as saying Italy faced a “horrible year”. Tremonti said the government would look next week at providing more to help the growing numbers of unemployed, on top of €8bn it says has already been set aside for extra benefits. 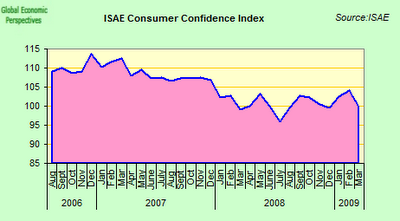 Italian consumer confidence fell for the first time in three months in March, with the Isae Institute’s consumer confidence index dropping to 99.8 from a revised 104 in February. Growing evidence suggests that the crisis is really hitting the Italian economy in a kind of back-to-front fashion, with the slump in the real economy (and especially the economic crisis in the East of Europe) threatening to drive Italian banks into more and more difficulty. The finance minister is under growing pressure from other cabinet members to increase government spending further, but understandably, Tremonti keeps pointing to Italy’s huge public debt as a major impediment to any serious stimulus plan. So it is simply a question of grin and bear it. Tremonti admitted at a recent meeting with banks, companies and unions that Italy had seen a greater credit market conditions tightening in recent months than most other eurozone economies. On the other hand he pointed to the fact that Italian banks had shown a “strong interest” in taking up the government-backed bond offer (which only totals €12bn) at the same time as he rejected criticism that the 8.5 per cent interest rate they carry was too high. Intesa Sanpaolo, which is Italy’s biggest bank by market value, has announced that it will apply for 4 billion euros worth of the bonds after it posted a 1.23 billion-euro fourth-quarter loss on writedowns. This makes Intesa the third Italian lender to take advantage of the country’s bank aid package, following similar decisions by Banco Popolare and UniCredit. Now here's an interesting story. Slovakia has just joined the eurozone, a status most of the rest of the EU's East European members would badly like to attain. But just to remind us that joining the zone, while offering considerable support and protection in times of trouble, is no panacea, Moody's Investors Service have last Friday cut their outlook on Slovakia’s government bonds rating (to stable from positive, implying their is no likelihood of an upgrade in the near future, a possibility which was implicit in the earlier positive outlook). Moody's justify their decision on the grounds that future investment in Slovakia is at risk due to a combination of factors: the recession in the euro-region, the country’s dependence on the car industry and its falling competitiveness compared with other eastern European nations, many of whose currencies have fallen sharply during the crisis. In fact the Slovak Finance Ministry forecast only last Friday that foreign direct investment into Slovakia will be much lower this year than originally expected - with the Minister stating he expected a decline in FDI to 0.6 percent of gross domestic product in 2009, compared with a 2.7 percent forecast before the economic and financial crisis hit the country. The worrying thing for me about all this, is not the immediate short term pressure which Slovakia will undoubtedly be under due to the regional crisis, but rather the loss of competitiveness issue, becuase it is ringing bells in my head about what previously happened in the case of Portugal (see my lengthy post on this here). The danger is that eurozone membership gets to be seen as a target you strive to achieve, and then relax into once it has been attained. The Southern Europe experience generally is not encouraging in this regard, and as they are finding out now, the hardest work begins after adopting the euro, since there is no currency left to devalue should loss of competitiveness prove severe. So I really do wish Jean Claude Trichet would exercise some of that famous "vigilance" on what to do about this issue too, since the long term future of the currency zone undoubtedly depends on getting this one right. In fact investors are already positioning themselves for a future weakening in the country's creditworthiness. Slovak five-year credit default swaps have been falling back recently, after hitting an all time high of 133.1 earlier in the month, according to CMA Datavision prices. (A basis point on a credit-default swap contract protecting 10 million euros of debt from default for five years is equivalent to 1,000 euros a year). 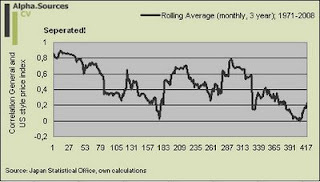 But the spread on Slovak government bonds has also been rising (see chart below), and the spread with the 10 year government bond vis a vis the German equivalent was 136.7 on Friday. The chart presents a pretty preoccupying picture, since while bond spreads have all been under pressure since the onset of last October's crisis, it is unusual to see investors perceiving credit risk rising in a country which has only just joined the "gold-digger" club. And Friday's warning shot from Moody's needs to be understood in this context. The country has seen a huge increase in its car manufacturing capacity in recent years, fueling double-digit economic growth in the quarters before the financial crisis, but amid waning western European demand for Slovak-made cars - including brands Volkswagen, Audi and Peugeot - the country now faces a stalling economy and rising unemployment. Slovak unemployment data for February showed the jobless rate reaching its highest level in more than two years, rising to 9.7% from 9% in January. Over 75% of the country's EUR332 million stimulus has now been spent, largely giving tax breaks to low-wage earners to encourage them to reenter the work force, and with a fiscal deficit ceiling of 3% of GDP to defend, spending cuts rather than stimulus cannot be ruled out, since VAT returns are falling fast. So while Slovakia's total public debt only equals around 30% of GDP, pressure on the spread could increase if the country is forced to increase its borrowing. Slovakia only expects to need EUR 5 billion in borrowing this year, and EUR 2.5 billion has already been secured in the first few months of the year. The Slovak economy slowed further in the fourth quarter of last year with real GDP growing by 2.5 percent year on year. 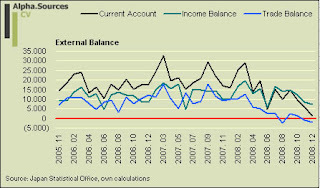 Whole year GDP for 2008 was 6.4 percent with total GDP reaching €67.33 billion. Economic growth had been 6.6 percent in the third quarter, and while there is no official data for seasonally adjusted quarter on quarter growth, I estimate the economy may well have contracted by around 1.5%. Part of the problem is the drop in export demand for Slovakia's car driven economy, and the country posted a trade deficit in January, as drop in demand was made worse by the suspension of gas deliveries from Russia. Exports slumped 29.9 percent on the year in January, the fourth consecutive monthly decline, and the biggest drop at least since 2006 when the statistics office began compiling data under the current methodology. 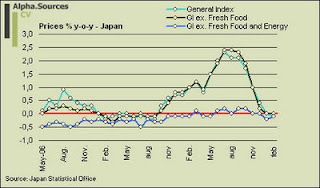 Imports were down 22.4 percent. The trade deficit totalled 279.5 million euros ($361 million), following a revised deficit of 341.6 million euros in December. 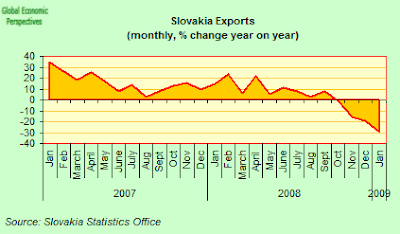 Slovakia posted a trade surplus of 42.3 million euros in January 2008. 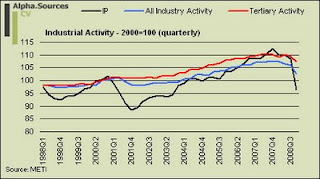 The drop in the demand for exports has obviously hit industrial production which decreased by 27 % year-on-year in January reach the biggest drop since the statistics office began compiling data in 1999. Manufacturing output fell 32,7 %. Construction output was also down sharply in January, falling by 25.6% year on year, although seasonal factors can obviously be playing a part here. Slovak retail sales fell by 3.3% year on year and totalled €1.3bn in January 2009. The largest contributing factor to this overall decrease was from the category of ‘other household goods in specialised shops’ retail which dropped by 24%. In addition sales of fuels ‘in specialised shops’ retail (15.6%) and the category of ‘retail sales realised not in stores’ (4.8%) experienced significant drops. Retail sales of electronics fell sharply (42.5%), and drops were also witnessed in the categories of: ‘food in specialised shops’ (15.8%); recreation and entertainment (12.7%); other goods in specialised shops retail (5.9%); and retail in non-specialised shops (4.5%). In the short term the Moody's decsion really doesn't mean that much, since Slovakia only had 28.6% (of GDP) in gross debt in 2008, but it is the mid and longer term dynamic we need to think about. Slovakia is about to issue a 2-year zero-coupon bond for an unspecified amount today, but the government debt agency is unlikely to have problems. However, as we have already seen in the cases of Ireland, Greece, Portugal and Spain, simply becoming a member of the eurozone is not a guarantee of anything in economic performance terms (although it does provide almost automatic protection from short term balance of payments crises). So it is important that Slovakia takes the appropriate measures to restore competitiveness now, otherwise we could see the horrifying spectacle of the eurozone's newest member steadily moving over to stand alongside countries like Greece, hovering around near the exit door, struggling desperately to avoid being rocketed out. First, the one year Euribor reference rate, which has been falling since the ECB started lowering interest rates in the autumn of last year. 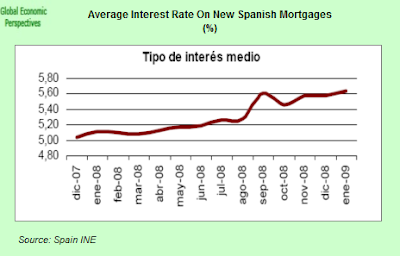 And secondly the chart showing the average rate of interest charged by Spanish banks on new mortgages, which as we can see, has been rising steadily since December 2007. 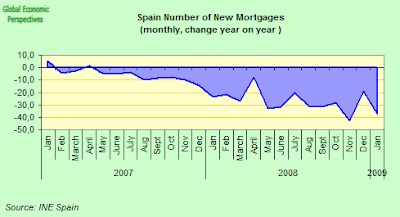 The average interest rate charged by Spanish banks for new mortgages in January 2009 was 5.64%, meaning that the average cost of a new mortgage had gone up by 10.2% over January 2008 (when the rate was 5.1%), and by 1.1% when compared with December 2008. 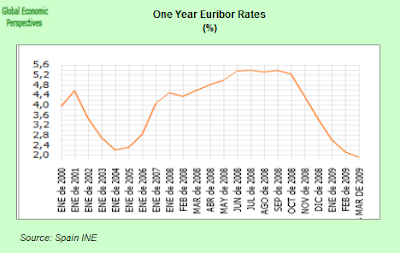 Meanwhile the Euribor reference rate looks set to close this month at all time record lows of 1.91%. In January - the last month for which we have data on mortgage lending - the Euribor rate was 2.27%. 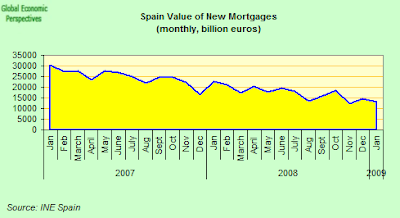 The reasons lying behind this upward movement in Spanish mortgages are twofold. On the one hand the Spanish banks are having increasing difficulty raising finance due to their perceived risk level, and on the other they themselves have have been forced to raise the risk premium they charge to clients due to the rising levels of non performing mortgages they have on their books. Basically what this means is that the ECB policy isn't working in Spain, and that despite the massive quantities of liquidity provided, the monetary conditions continue to tighten, and doubly so give that the real value of the rates charged (ie the inflation adjusted value) keeps rising automatically as inflation falls. Mortgage lending in Spain more than halved in January while the number of homes started in the fourth quarter dropped an annualy 62 percent. The 51.7 percent year on year fall in mortgage lending for urban dwellings was the steepest in 12 straight months of decline. House sales fell in January by 38.6 percent, figures published earlier this month showed, and Housing Ministry data showed the foundations of only 40,737 homes were laid in the fourth quarter - 62 percent fewer than in the fourth quarter of 2007, and 27 percent down on the preceding quarter. During 2008 as a whole, Spanish builders started 360,044 homes - a 41.5 percent fall on 2008. On the other hand 633,228 homes were completed last year, reflecting the optimist which prevailed in 2006/07 when the buildings were started at the height of the boom in 2006-07. Spain has a supply overhang estimated at almost any number you like over 1 million unsold homes (the minimum estimate, and no one really knows), or more than three times the number of new households created each year in Spain. The number of mortgages offered has crashed as banks restrict credit given forecasts non-performing loans will reach around 9 percent next year, while unemployment is now likely to rise above 4.5 million by years end, up from the current 3.5 million. As I indicated in this post yesterday, we are moving from a situation where people the banks were afraid to lend, to one where people become increasingly afraid to borrow (since they don’t know when they will lose their jobs, or even their homes), with Spain's citizens becoming more and more reluctant to take on additional debt due to fears they could be caught in the next round of job losses. As a result January mortgage lending falling to 6.47 billion euros, while the rate of new bank lending to households dropped to 3.9% year on year. 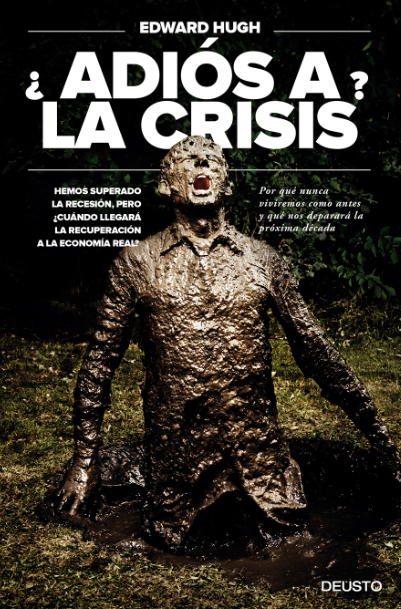 Spanish debt defaults leapt 197 percent in 2008, with construction and property firms accounting for 4 of every 10 failures. The number of firms and individuals that filed for administration rose to 2,902, the highest level on record, according to Spain's National Statistics Institute. 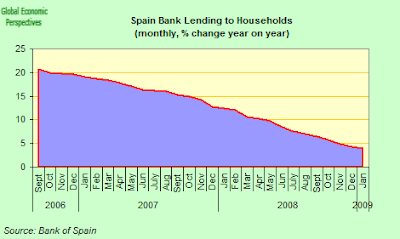 Also bad loans at Spanish banks rose by 15.3 percent in January, the sharpest monthly increase since property developer Martinsa Fadesa filed for administration in July. Bad loans rose more than 9 billion euros to 68.18 billion in January compared with an average monthly rise in the last six months of around 5 billion euros. The non-performing loans (NPL) ratio for all institutions was at 3.8 percent in January, up from 3.3 percent in December, with rates among savings banks the highest at 4.45 percent compared with 3.79 percent a month earlier. Commercial banks had an NPL ratio of 3.17 percent, up from 2.81 percent. 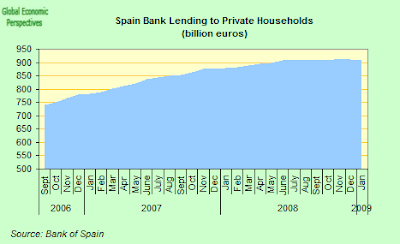 In fact Spain's financial institutions have seen NPLs more than quadruple in the last 12 months from 16.23 billion euros in January 2008. Spain's savings banks, responsible for about half the country's loans and the most exposed to the property market downturn, could see NPLs rise to 9 percent by 2010, according to the saving banks association. What To Do With The Bad Banks? As a result of all this a furious public row (unusual in Spain) has broken out over what to do with the broken banks. The Spanish Economy Minister Pedro Solbes has said the government is prepared to recapitalise healthy banks but suggested that those with serious solvency problems should seek a merger rather than look for state aid. "In cases where banks have acted correctly in relation to solvency and the health of their accounts...logically they could receive support," Solbes said in a speech to an economic conference in Madrid. "Banks that are unable to remain solvent and clean up their accounts should cease to be players in the financial system so they don't generate distortions in the public sector." What he has in mind is that the troubled banks should turn to Spain's privately-funded Deposit Guarantee Fund (FGD) should they need capital injections to make tie-ups viable. 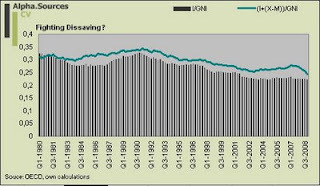 However, the insurance fund holds only 7.2 billion euros in bank contributions, and since this is orders of magnitude less than the size of the problem it is obvious the government will end up having to putting money into the recapitalisation process, and especially into the Savings Bank sector, since the Spanish press has been reporting that 20 of Spain's 45 savings banks are now considering mergers. And it is obviously only a matter of time before one of the mid-sized Spanish banks like Popular, Sabadell or Banesto joins the consolidation process. Clearly many of those most directly involved in the banking industry are laothe to accept the Solbes formula, since wuite simply they cannot afford it. And this was made pretty clear by Francisco Gonzalez, chairman of Spain's second largest bank BBVA, when he pointed out last week that nationalisation of the bad banks was the only realistic way forward. 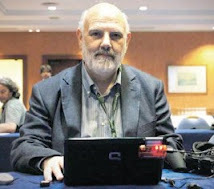 "When a bank shows signs of extreme weakness the authorities should take control of it, which implies removing the directors and reducing or eliminating share capital in the institution," Gonzalez said at a conference in Madrid.Governments should then appoint a new team to separate toxic assets from healthy ones and quarantine them in publicly controlled funds, the chairman said, advocating a level of state intervention not yet seen in Spain. "Then the bank would be privatised again through a transparent sale to private companies," he said, without making specific reference to Spanish banks. Two Spanish regional savings banks have already reached a preliminary merger deal - Unicaja, based in Spain's southern Andalucia region, and the smaller Caja Castilla La Mancha (CCM), located in the central-southern province of the same name - following talks which were carefully brokered by the Bank of Spain. Clearly this merger willl need to be followed by a capital injection from Spain's Deposit Guarantee Fund to help them clean up the "troubled assets" which will naturally be found in the combined accounts of the new bank which emerges. Many other such regional caja "weddings" are obviously soon to follow. But the big question is, where will all the financing come from? It is pretty clear that the problem which is building up is bigger than Spain can handle alone, and finance (not loans) from the European Union will be needed, with centrally backed EU Bonds being the most likely mechanism with which to fund the injection. Hungarian Prime Minister Gyurcsány steps down - now what? Last Saturday's announcement by Hungarian Prime Minister Ferenc Gyurcsány that he was stepping down after almost five years as head of government may have come as a surprising turn of events, given that he had stubbornly clung to office despite his growing unpopularity over the course of the last three years. However, what turned out to be completely unexpected was the method he chose to end his mandate: a constructive vote of no-confidence in the National Assembly (Parliament) against his own government. Under a constructive no-confidence motion, Parliament votes to replace a sitting prime minister with another person, rather than simply bring down the government. This mechanism was introduced in the former West Germany after World War II, in order to prevent a recurrence of the parliamentary deadlock that contributed to the demise of the 1919-33 Weimar Republic. Constructive votes of no-confidence have been adopted by other European countries - Hungary being one of them - since they ensure cabinet stability by preventing Parliament from removing a government from office without having agreed upon a replacement; in Germany there has only been one successful constructive no-confidence motion, which took place in 1982 when the Bundestag voted to replace Chancellor Helmut Schmidt with Helmut Kohl, after the liberal Free Democratic Party - at the time the Social Democratic Party's junior coalition partner - switched sides and formed an alliance with the Christian Democratic Union/Christian Social Union. However, Gyurcsány plans to use the constructive vote of no-confidence to install another Socialist-led cabinet, and his government - which has become the third casualty of the global financial crisis, joining the ranks of Iceland and Latvia - appears to have resorted to this unusual maneuver for one simple reason: to avoid an early election. Gyurcsány's post-communist Hungarian Socialist Party (MSZP) won Hungary's 2006 general election in coalition with the liberal Alliance of Free Democrats (SZDSZ), but in September of that year a leaked tape revealed that the prime minister had lied about the state of the Hungarian economy to secure re-election. Gyurcsány never recovered from this revelation, which triggered widespread protests that degenerated into rioting. Despite mounting calls for his resignation after the ruling parties suffered a heavy defeat in municipal elections held the following October, Gyurcsány refused to step down and subsequently won a vote of confidence in the National Assembly. The Socialist-Liberal coalition government then went on to impose fees for visits to the doctor, hospital stays and university tuition, as part of an austerity package intended to reduce the country's large budget deficit (the highest in the European Union as a percentage of GDP) and pave the way for Hungary's adoption of the euro as its currency. However, Gyurcsány suffered yet another stinging defeat when the measures were soundly rejected by voters in a March 2008 referendum. Shortly thereafter, the Liberals left the government after Gyurcsány sacked the SZDSZ-appointed Health Minister; nonetheless, the Socialists remained in power as a minority government with external support from the Liberals. Meanwhile, Hungary's already weak economy took a sharp turn to the worse, which left the country no choice but to take a $25 billion international rescue package from the International Monetary Fund, the European Union and the World Bank. Recent opinion polls have Hungary's main opposition party, the right-of-center Fidesz-Hungarian Civic Union ahead of the Socialist Party by more than forty (40) points; not surprisingly, Fidesz continues to press for an early vote, while the Socialists are hoping that a new prime minister will turn the party's fortunes around before a general election is held by the spring of 2010 at the latest. However, barring some completely unforeseen development it is highly unlikely the Socialists will be able to overcome Fidesz's massive lead, although they could conceivably reduce it. At any rate, Fidesz's large advantage would almost certainly be amplified by the complicated electoral system used to choose members of Hungary's unicameral Parliament (reviewed in Elections to the Hungarian National Assembly), which combines French-style runoff voting in single-member constituencies with regional-level party-list proportional representation and a cumbersome top-up national list. By resorting to a constructive vote of no-confidence, which will be submitted to the National Assembly next April 6 (with a vote scheduled for April 14), Gyurcsány has left President László Sólyom out of the process. Hungary's head of state has made it clear he favors holding an early election, noting that the new prime minister would be in office for at most one year before the next general election would have to be held; nonetheless, he cannot intervene unless Gyurcsány actually resigns. In the meantime, the Socialist Party - still chaired by Gyurcsány - has proposed three candidates for prime minister: former National Bank governor György Surányi, former president of the Hungarian Academy of Sciences Ferenc Glatz, and András Vértes, president of the GKI economic institute. The Liberals have already indicated their willingness to support Surányi; poll findings suggest SZDSZ could be wiped out in the next election, so the party has little appetite for an early vote. The Socialists have also been courting the moderately conservative Hungarian Democratic Forum (MDF), whose votes could prove to be crucial if they can't secure support from SZDSZ. While an early general election remains somewhat unlikely, it should be noted that voters will still go to the polls next June to choose Hungary's representatives in the European Parliament, and the outcome of that poll could be indicative of what lies ahead. The Hungarian Socialist Party and the Alliance of Free Democrats reached an agreement on Monday, March 30 to support the nomination of Economy Minister Gordon Bajnai for prime minister in the upcoming constructive vote of no-confidence. In turn, Bajnai will name non-party experts to key cabinet ministries, as proposed by SZDSZ. Although the Socialists and the Liberals had previously agreed to elect former Central Bank governor György Surányi as prime minister, he had indicated he would serve as head of government only if he was supported by all parliamentary parties; however, the opposition Fidesz-Hungarian Civic Union made it clear that it would not back Surányi, and as a result he declined the nomination. In a related development, outgoing Prime Minister Ferenc Gyurcsány has also resigned as chairman of the Socialist Party.